Like any good Texan, I like to squeeze off a few rounds at my local indoor firing range every now and again. So I was pleasantly surprised when I found this very pretty red 1961 AMC Ambassador by Rambler outside of the range in southwest Austin earlier this week. What a cool car. And it's timely, too, since just last week we had the scion of former AMC president George Romney running for president, and we had a Used Car Face-Off between a Buick and an Ambassador. The Rambler nameplate is an incredibly storied one. It began life as its own brand in the late 1890s, then it was purchased by Nash, who merged with Hudson in the 1950s to form American Motors. The Rambler, classified as a compact car back in the day, was sold more or less identically as both a Nash and a Hudson for a while until those nameplates were completely killed off. The Ramblers were quite successful for a time. 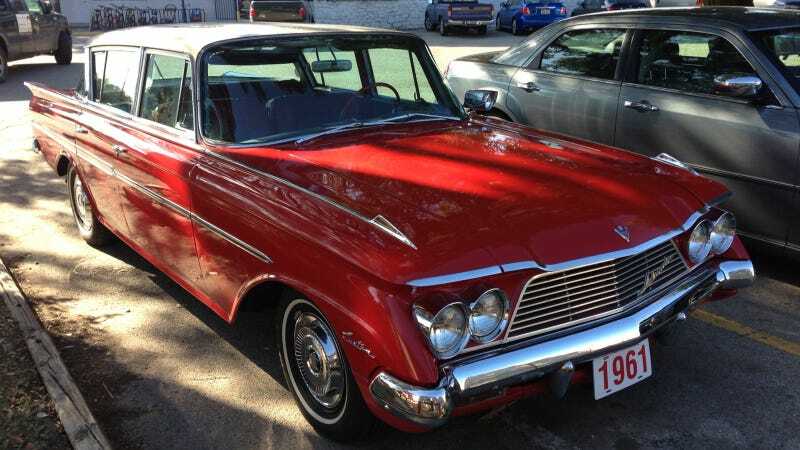 By 1961, the Ambassador was the flagship of the Rambler lineup, powered by a 327-cu.in V8. Some consider it to be the first real American luxury compact car. It's certainly smaller than some of the land-boats we've featured on Found Around Town from the same time period. Stylistically, it's kind of all over the place, with its tailfins, swooping hood and front fenders that sort of bulge out beyond the bumper. I do like the shape of that back window, though, and that crazy oval-shaped speedometer. Some of those styling cues were kind of on the way out by 1961, and so the car's looks were toned down quite a bit the following year — particularly the outrageous front end. The Rambler Ambassador received a full redesign in 1963, and that generation looked far more staid. This red one may not be the best looking classic American car, but at least it isn't boring. Do you have any memories of old-school AMC cars?